History is king in attractive Richland. 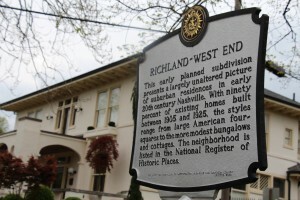 A site listed on the National Register of Historic Places, this highly priced and historic neighborhood in Nashville’s popular West End features a range of early century homes paired with beautifully landscape yards and gorgeous draping trees. If the architectural eye candy wasn’t enough to draw you, these sidewalked streets are just minutes from anywhere. With your central location right off West End Ave, you can walk or jog the McCabe Greenway, find a shady spot to read at Elmington Park, or hop in the car for the multiple dining and shopping options within just a few miles. Day to day conveniences are also just around the corner with major retail outlets along nearby White Bridge Pike.